You’re More Than You’ve Become! Did you know that when God looks at you He sees Jesus? That’s right! If you have accepted Jesus as your Savior and Lord, you are clothed in the righteousness of Christ . . . Paul declares this reality in Philippians 3:9, “… found in [Christ], not having a righteousness of my own that comes from the law, but that which comes through faith in Christ, the righteousness from God that depends on faith.” So, you see, in God’s eyes you are perfect in every way. However, you are not yet what you will one day become! God sees that too, because He is in the process of setting it up. When these words were spoken to Gideon, he was a laborer who was threshing wheat . . . not a mighty warrior doing battle with the Midianites. However, in the sight of God, Gideon was more than he had currently become, and God was about to show him just how much more. God was in the process of making Gideon a great warrior and leader, and the way God would arrange it, there could be no doubt who would be responsible for the victory and therefore who would get the glory. Gideon started with 32,000 men who said they were ready for battle. However, when the Lord completed the process of cutting Gideon’s army down to the right size, only 300 men remained. From Gideon’s perspective there was just one problem with that result: Gideon’s company of 300 men was dwarfed by the 100,000-plus Midianite army they would be facing. But what Gideon didn’t yet fully understand was that the strength of His army was not to be found in the size of his troops, but rather in the size of his God. God kept less than one percent of Gideon’s original force in order to make it clear to everyone that victory would come as a result of God’s power and strength, not man’s. As the Lord of hosts has declared elsewhere, when God works it is “’Not by might, nor by power, but by My Spirit’ says the Lord.” (Zechariah 4:6). For the first time in his life, Gideon would have to trust fully and completely in God – not in himself – to become what God was calling him to become. So . . . where in your life right now is God calling you to trust Him fully and completely? Where is He working to grow you into more than you’ve become? God may not be calling you to be a mighty warrior on a battlefield; perhaps He wants to make you a mighty spouse . . . a mighty employee . . . a mighty minister of the Gospel. You see, the Gospel frees you to walk by faith and not by sight. God doesn’t care what your opposition looks like to you. He is the One who is going to fight your battle and He is the One who will win the victory. God is in the business of showing Himself supernaturally strong through the unbelievably weak . . . if we will but trust Him. We are, by nature, restless. We are restless in our relationships; we are restless in our work; we are restless in our station in life; we are restless in our success; we are restless in our failure. Restlessness is as much a part of our mental makeup as our desire for food and shelter. And make no mistake; even after Jesus shows up and turns our lives upside-down, we are still restless. Here God confirms two very important things. First, He acknowledges the fact that we are restless. And second, He promises to give us rest. Our Lord issues this invitation in Matthew 11:28, “Come to Me, all who labor and are heavy laden, and I will give you rest.” What a word of comfort that is to me! I pray that you, too, will draw great comfort today from these promises of God. Even we who are His adopted children are not immune to restlessness. And do you know why? It is because we forget who God is and what He has done for us. Some of God’s children are restless because they simply cannot get past their past. Gnawing guilt has a death grip on them. Instead of resting in the righteousness of Christ, glorying with Paul that they do not have “a righteousness of my own that comes from the law, but that which comes through faith in Christ” (Philippians 3:19), they are restless in their own righteousness—the flimsy fig leaves of self-righteousness which have failed them time and time again. They promised to do more and try harder, but with each passing promise, they realized just how far short they continue to fall of God’s intended mark. Others find themselves restless because they are fearful about their future. Uncertainty about unsettling providences, which began as a minor infection, has turned into a raging disease. Instead of resting in the certainty of Jesus, they are restless in the uncertainty of life. They count on created things, which can never provide them with the rest that only Jesus can give. Yet in all of our restlessness, Jesus has promised us rest. As children of God, we have a past that has been perfected and a future that has been promised. We no longer have to be afraid of judgment because Jesus took all God’s wrath and nailed it to that dirty tree. He took the cup of God’s judgment and drank it down, draining every last drop! ”There is therefore now no condemnation for those who are in Christ Jesus” (Romans 8:1). We can live at peace with God, because God is at perfect peace with us, thanks to the finished work of Christ on our behalf. Even when we are confronted with heartbreaking news, we can turn to the One whose heart beats for us and find rest in Him. The Gospel also tells us we no longer have to attempt the role of personal deliverer, redeemer, or savior. Jesus has paid it all! He has done it all for us. God is not angry with us. God is not disappointed with us. God is not frustrated with us. And do you know why? Because God is well pleased with the sacrifice of His perfect, precious, and beloved Son. Because we are in Christ, we are in! We are part of God’s eternal plan and purpose, a plan that was determined before the ages began. We are objects of God’s grace and favor and love. We are recipients of God’s mercy. We are adopted into God’s family and receive His care. The Lord said to Moses—and He says to us today—“My presence will go with you, and I will give you rest” (Exodus 33:14). Because of the gargantuan grace of the gospel, resting is the order of the day . . . not restlessness. What does that mean for us today? If we have not placed our trust in Christ’s atoning work on our behalf, it is impossible to please God and earn His favor. Our sin-filled condition, which we inherited from Adam, makes it impossible for us to stand before a holy God. As Paul wrote to the Christians at Rome, “All have turned away, they have together become worthless; there is no one who does good, not even one” (Romans 3:12). In short, we are born under a sentence of eternal death; we desperately need a Savior, and His name is Jesus Christ. Once we settle the issue that we have not been saved by our good works, we must understand that we have been saved to good works. To be sure, God does not need our good works, but our neighbor does. Our good works put our good God on display to the watching world. They give those who are not believers an accurate picture of the gracious God who loved the world so much He sent His Son to save all those would believe in Him (John 3:16). Jesus “went around doing good,” and most often it was to those who were, in the eyes of sophisticated society, bad – really bad. Jesus did good to prostitutes, Samaritans, and even tax collectors, who were perhaps the most despised of all Jews, being seen as mercenary traitors to their people. Jesus did good to the sick, the broken, and the marginalized. And, as His faith followers, we too should be going around and doing good. So . . . how would you rate yourself in the area of doing good? How would those closest to you answer that question? In God’s infinite wisdom, we have been saved – not by our good works – but to do good works. In John 16:12, Jesus said to His disciples, “I still have many things to say to you, but you cannot bear them now.” Our Lord was not speaking solely for the benefit of those who were listening at that moment; He was teaching all of us a biblical truth: God is not finished with us yet! Now, if you are anything like me (a great sinner in daily need of an even greater Savior), that is not only a source of unimaginable comfort, but of unbelievable freedom. Because God is not finished with you yet, you are in a continual state of process and progression – not perfection. You don’t know everything you are going to know. You don’t think everything you are going to think. You don’t say everything you are going to say. You don’t do everything you are going to do. You are not everything you are going to be. And because of the promised reality of what you will one day be – “conformed to the image of His Son” (Romans 8:29) – you can rest in the reality of your freedom today. You are free to enjoy. You are free to risk. You are free to relax. You are free to desire. You are free to laugh. You are free to sing. You are free to sorrow. You are free to forgive. When Jesus told Peter he was going to deny Him three times that night, He was telling Peter he was free to fail . . . and fail he did! After promising to die to keep from failing his Lord, Peter did fail Jesus three times, but the story of his failure doesn’t end there. Jesus didn’t forget about Peter, and Jesus didn’t forsake him. After the resurrection, Jesus restored, recommissioned, and resent Peter to advance the cause of His Kingdom. The freedom we experience in the Gospel is hard to believe. And let me say this; if it’s not hard to believe, it’s not the freedom of the Gospel! Because Jesus came to set the captives free, everyone who belongs to Jesus is free. And in that freedom, there is even freedom to fail. Regardless of where this finds you, whether you are coming out of a failure or getting ready to stumble into another one, fear not! And when you fail, remember that Jesus is waiting to do the same to you that he did for Peter – to forgive you, restore you, recommission you, and resend you – time and time again! Sounds strange, doesn’t it? Life by a thousand deaths. How in the world can we have life . . . by death? Let’s take a look. The apostle Paul is saying that dying daily is the only means to finding life. Remember, Paul also said that “to live is Christ and to die is gain” (Philippians 1:21). He made it abundantly clear that the Christian life requires one to die daily. Death to our selfish, sinful desires. Truly, life will only be found in a thousand deaths! We must keep in mind that “death” simply means the absence of life; in the spiritual life of the Christian, it means that the old self dies daily and ceases to be the foundation upon which life is built. We die daily to our selfish, sinful desires and live moment-by-moment for our Savior. Without death to self, we simply cannot be alive to our Savior. Just a cursory glance through the Gospel accounts makes it perfectly clear that this was the point where many turned away from Christ. They refused to make Him Lord over their lives. The Rich Young Ruler (Matthew 19:16-26) is one of the most poignant examples of this truth. When Jesus explained what was required to be His disciple, the young man went away sad, because he had great wealth. He refused to die to the self and life for the Savior. And let me be clear here that his problem was not the fact that he had great wealth. Many Christians throughout the ages have had wealth, yet have wholeheartedly lived their lives for the Savior. The problem is not with what we possess, but what possesses us . . . and if our passion is not for Jesus, then we are living for a savior that simply cannot save. When Paul said, “I have been crucified with Christ; it is no longer I who live, but Christ lives in me. . .” (Galatians 2:20) he was making it clear that there is no life to be found outside of Christ. To be sure, there are many things in this world that promise life, but only One who can deliver on that promise . . . and His name is Jesus Christ. We hear a great deal from preachers talking about living a victorious life, but what does that really mean? For the Christian, the answer is clear: it means living to glory in God. When used as a verb, to glory in God means to revel, boast, delight, and rejoice proudly in God. So . . . what does the testimony of your life say about this verb for victorious living? Jeremiah made it clear that, while there is much that is good in life, we are not to glory in it. We are not to revel, boast, delight, and rejoice proudly in the things of this world. Our God says we are not to glory in . . . Wisdom, strength, and wealth are just a few of the good gifts we receive from God, yet we are admonished never to glory in any of them. What we are to glory in is our increasing understanding and knowledge of the Lord Jesus Christ. You see, to glory in God is true wisdom, strength, and riches, and these can never be found in anything other than Jesus. It is important to lay out what these three dimensions of increasing in understanding and knowledge of God look like in the life of the believer. It is intellectual. We increase in knowledge of the absolute truth about God. The more we know God the more we will love Him and willingly give our lives to Him. It is volitional. We make a conscious choice to move beyond knowing God to trusting God. The more we give our live to God the more we will feel at ease to trust Him. It is done out of love. Our obedience to the Word of God is rooted in love – both vertical (love for the Lord above) and horizontal (love for the people around us). The more we trust God the more we will be filled with adoration, love, and praise to Him. My prayer for you today is that this verb, to glory in God, consumes you like a raging fire. That by living the victorious Christian life you will positively impact everyone you come in contact with for the glory of God . . . by glorying in God. David was inspired by the Spirit of God to write this psalm – not when the sun was shining, the skies were blue, and the clouds were fleecy – but when he was surrounded by enemies. Dear reader, no matter what obstacles, or challenges, or trials, or enemies you face today, whether in your personal life or your professional life, they will all be overcome when you call on God, because He is for you! You may be facing challenges which seem insurmountable today, but it matters not. God is for you! God is so for you that the day came when He stood against His own Son. Picture the cross . . . hear the Son’s agonized, despairing cry – “My God, My God, why have You forsaken Me?” and think on that truth for a moment. What father could possibly turn away from his son after hearing that plea? 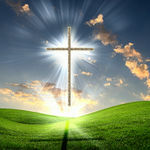 How could the God of love forsake His beloved Son as He was hanging on that cruel cross? Because God was for us . . . even when we were against Him! We cared nothing for the things of God; they were foolishness to us (1 Corinthians 2:14). We were expanding the cause of our own kingdom and not His. We were alienated from God, thinking ourselves to be His enemies (Colossians 1:21). And yet while we were still sinners, God demonstrated how much He is for us by turning His holy hatred for our sin on His only begotten Son, the sinless God-man – putting Jesus in our place, giving Him our nails and our crown of thorns (Romans 5:8, 10). First Baptist Church Is Celebrating 150 Years This Sunday! What a great day of rejoicing that will be! We are anticipating welcoming many former members, pastors, and staff for this significant day in the life of our church family. As we have reviewed the history of our church, we have learned about many building programs (the first building the church met in, the first building it built, the rebuilding after the 1943 fire, the remodeling of that building, and the addition of the educational building and chapel). Those were significant moments in the life of our church family. However, the greatest headline and continual story is not about buildings and budgets but about how God has worked through His people. The one resounding focus of our church’s history is that through His dedicated people a message of life and hope and a ministry of love and help has sounded forth and been expressed within the church buildings and outside the church in the lives of its members. Through the years First Baptist has focused on reaching and ministering to people of all ages and backgrounds. Our church family has sought to provide a ministry to the whole family, whether that family consists of one or several. First Baptist has always had a commitment to preaching and teaching God’s Word to people as they are. This has been done through meaningful worship, an on-going Bible Study ministry for all ages, musical pageants and dramas, mission education (through the Women’s Missionary Union, Acteens, Girls in Action, Mission Friends, and Royal Ambassadors) and mission involvement (sending out missionaries to Argentina, Paraguay, China, the Far East, and Philadelphia). Members have also gone on short-term mission trips to Colorado, Wyoming, Nebraska, South Dakota, and Iowa. Caring about our community, we also started a Food Pantry ministry to the residents of Bates County that today is community-wide ministry reaching about 300 families each month. More recently First Baptist has sought to continue the church’s heritage of outreach, evangelism, and discipleship through providing a mid-week time of Bible memorization and practical Bible study for the children of our community through Awana, an on-going, relevant discipleship ministry for our youth, as well as Women’s and Men’s Ministries. We also are in the initial stages of beginning a Single Adult Bible Study ministry. First Baptist seeks to lead people into a life-changing relationship with Jesus Christ and help them strengthen their faith for their daily life in Christ. One of the ways we do that is through the bi-annual presentation of “Judgement House” to the Community. This is a three-day drama presentation, involving over 120 actors and workers (we are thankful that members from area churches now join in to help us), where the church is transformed into 8 scenes that present a common life scenario and clearly communicates the Gospel message and importance of settling your eternal destiny by choosing Christ as your Savior. The story of the people of First Baptist Church is still unfolding. In the midst of today’s society that has a cloudy and confused understanding of Christianity, our desire is to have a clear statement of the true marks of our faith. (1) Honor and glorify God in our worship and work. (2) Strengthen believers through worship and the teaching of God’s Word. (3) Reach the lost with the life-changing message of the gospel of Jesus Christ. The members of First Baptist Church are well aware that the history of First Baptist church has been a small part of His Story through the ages. We are grateful for what God has done and seek to make much of Him and His great love and life for us through Jesus in the years to come. The apostle Paul knew, by grace through faith, the gain that will be found on the other side of the grave. He knew and trusted in the Lord Jesus Christ as his Savior and Lord . . . and that is the key to faring well in our farewell. Paul lived constantly in the light of eternity. He was so captivated by Christ that his earnest desire was to depart and be with Him, yet he knew he had more ministry to do in this world until that moment when his Lord would call him home to be in the next. Paul knew that whatever joy and pleasure he experienced on this side of the grave paled in comparison to what he would experience in the presence of his Lord on the other side. It was Paul who reminded the Christians in Corinth of Isaiah’s word of encouragement: “Eye has not seen, nor ear heard, nor have entered into the mind of ma the things which God has prepared for those who love Him.” (1 Corinthians 2:9). Paul knew he would experience the fullness of his salvation in unveiled and unhindered intimacy with Jesus. Because Jesus was Paul’s greatest treasure in life, he knew his greatest gain would be death. Do you know that truth? Sadly, for many, the answer to that question is no. Those who have not trusted in Christ alone for salvation will fare poorly in their farewell. They have lived for treasure infinitely less than Jesus; when they are faced with their inevitable departure from this world they are overwhelmed with unsettling emotions. Death to them is not gain; it produces fear and an unimaginable pain of loss. Make no mistake, the way we die – the way we approach our final moments in this life (if we are given that time by our Lord) – makes it clear what our treasure has been. The only way to fare well in our farewell is to live like the apostle Paul and see death as the ultimate gain, because we know that Jesus is on the other side, waiting to welcome us home. When our treasure truly is Christ, we will not fear death; we will know how to die well. I am reminded of the last words of Confederate general Thomas “Stonewall” Jackson. Mortally wounded at the Battle of Chancellorsville, Jackson hung between death and life for days. Toward the end he slipped into delirium, barking commands to imagined troops. Then, a witness recalled, Jackson’s tone abruptly changed. He smiled, and his last words on this earth were, “Let us cross over the river, and rest under the shade of the trees.” Thomas Jackson had no fear, no pain of loss – only eager anticipation of entering the presence of the Lord. In knowing how to die well we will know how to live well! We will refuse to live for anything smaller than Jesus. We will turn our backs on the fleeting pleasures of this world and focus on the all-satisfying eternal pleasure in the world to come. Only when we can sincerely say that “To live is Christ” can we live out the truth that “to die is gain”. This is faring well in our farewell, and nothing can ever rob us of this joy. This has been my personal experience in saying good-bye to the saints of God. I hope it will both comfort you and challenge you to keep your eyes firmly fixed on what God has prepared for those who love Him. It is one thing to believe in the truths of the Gospel. We are sinners in need of a Savior and His name is Jesus Christ. There is nothing we in us, nor is there anything we can do that will satisfy God’s righteous demands. Jesus is the only Savior – Jesus lived a perfect life . . . died a sacrificial death . . . was raised on the third day . . . . . . and ascended into heaven, where He sits at the right hand of God the Father. All this is head knowledge. But it is another thing altogether to embrace these truths with our hearts daily. Intellectual assent to the doctrinal truths of the Gospel is where we all begin our journey into the reign of grace. But from there these truths must move down to our hearts and take up residency daily so that we continually embrace the Gospel moment by moment. The Gospel enters into our minds doctrinally but it is to continue moving through the heart experientially as we the Holy Spirit, by God’s grace, to make these truths a daily reality in our lives. Sadly, for far too many in the church today, there is a disconnect between that 18-inch span that separates the head and the heart. That disconnect leads to Gospel blindness and barrenness. There are those who have the words of truth in their heads but no wonder-working power of it in their hearts. But this is not what God wants for us! You see, the Gospel is not only for the lost, it is also for the found, because the Gospel is for sinners. And sinners we still are, even after Jesus becomes our Savior and Lord. We need the truths of the Gospel set before our blind eyes and deaf ears daily, that we might begin to see the wonder and experience the power of the grace of the Gospel. Is it not a wonder to think that Jesus would die on the cross for those who nailed Him to that tree? And thank God for the power that made the earth shake and rocks split, a power which signaled the destruction of the barrier that separated us from God. We live not only under the banner of the finished work of Jesus Christ for our salvation, we also live under the banner of His promise to complete what He started in us (Philippians 1:6). You are not yet what you will one day be! This means you still do things you would rather not do. Are you still dealing with anger? How about impatience? Are you wrestling with a bout of unbelief? Even though, because of the glorious resurrection power of the Christ, sin no longer reigns, it still remains, and that is why we must keep preaching the Gospel to ourselves every day. We need to be continually reminded of what Jesus has done for us and what He has promised to continue doing. We must continue advancing further in and further up into the truths of the Gospel, that we might experience the freedom and joy that comes with knowing that we are both fully forgiven and completely loved – and nothing we do will ever change that. What we believe about the Gospel is the only cure for our unbelief. We need to be reminded that it is not about our faithfulness to Him, but rather His faithfulness to us. We need to dwell upon the truth that there is nothing that can separate us from the love of Christ. He took the betrayals because of His love for you. Jesus took the false accusations because of His love for you. He took the beatings because of His love for you. He took the thorns because of His love for you. He took the nails because of His love for you. He took the mocking because of His love for you. He took the forsaking of His Father because of His love for you. He took the death because of His love for you. But that is not the end of the story! Though Jesus really died, He got up and walked, just as He said He would, and one day He will return to finish what He started. When our hearts beat in tune with these truths, our blood becomes oxygenated with the glorious grace of the Gospel. And as it pumps through our veins, we desire more and more each day to lay down our lives for His glory and the good of others.